One of the popular items given out every year is a festival hat. In prior years it was a Jack-O-Lantern hat. Another popular activity is streaking – removing your armor and parading around in your underwear. Droknar’s Forge is decorated in a seasonal mood as well. 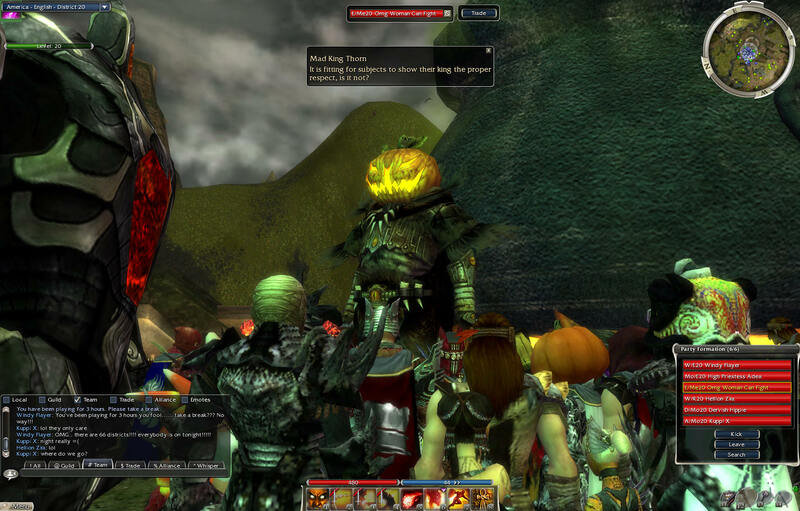 Starting at midnight pacific time of Halloween, Mad King Thorn appears at Lion’s Arch every three hours on the hour. He engages the party goers in a series of tests and each test you get right does not kill you – for about 10 seconds after which you are revived – and treats you with a trick-or-treat bag. Laugh at the King’s jokes. If you don’t type /laugh into your chat line at the right time to laugh, you die. A version of Simon Says, with you doing the right /emote – Roar, laugh, Cheer – in response to the Mad King’s instructions. It is interesting to note how so many of the folks failed to catch on. Rock- Paper- Sissors with members of the audience. Individuals are picked out to play rock paper sissors, which is oddly built into the game as /rock, /paper /sissors commands. And if you don’t win you die, for ten seconds, and if you win you get a trick or treat bag. The whole process goes on long enough that I was able to get about twenty trick or treat bags and I only was able to type the right thing about eighty percent of the time. There are timing and lag issues with some of the commands. 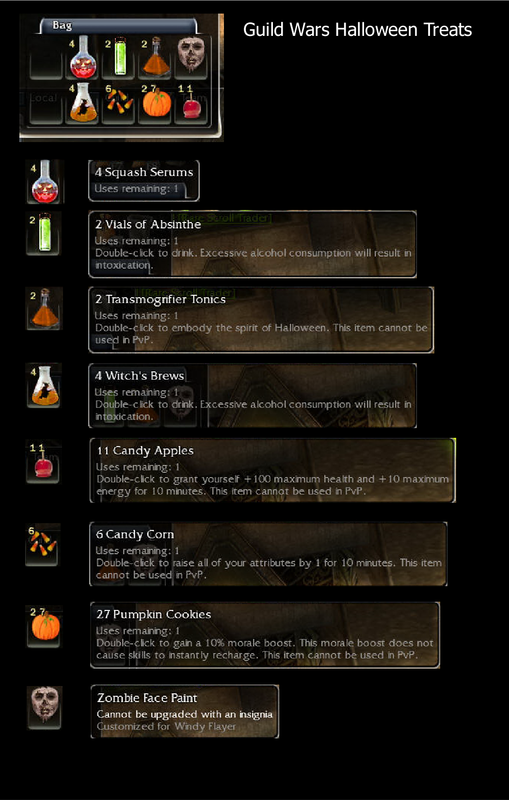 Here are the treats from the trick or treat bags. This is this years hat, the Zombie Mask. 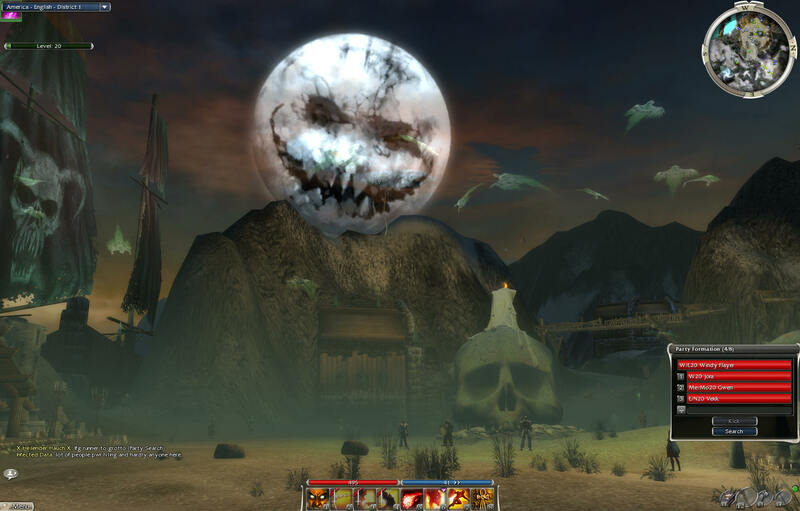 Halloween continues in Guild Wars until November 2.